James has been successful in real estate investing for the past 20 years because he knows how to invest in changing real estate market cycles like the one we are experiencing. Now is not the time to be on the sidelines; it's time to get in the game and invest with no risk! 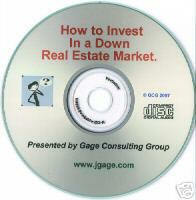 In this CD, James gives all the main elements to get started quickly making money in a down market.